By Car: Drive along the Kota Tinggi trunk road to Mersing. Journey takes approximately 2 ½ hours. 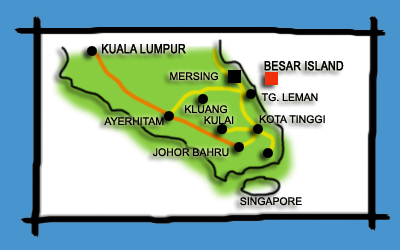 By Air: Take a connecting flight to Senai Airport, Johor and continue journey by taxi to Mersing Jetty. Journey takes 2 hours. By Car: Drive along the North-South Highway, exit at Air Hitam interchange. After the toll booth, turn right and proceed to Kluang town. Follow sign boards to Mersing. Journey takes 4 ½ hours. Boat from Pulau Besar to Mersing at 1030 hrs daily. © 2019 D'coconut Island Resort.